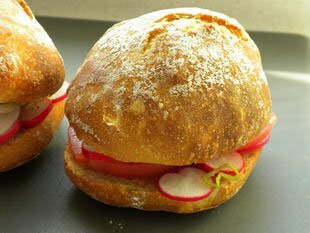 Pan Bagnat is a traditional recipe from the Nice area. The name means "soaked bread", as it consists of a round bread roll that has been drenched with a mix of oil and vinegar then filled vegetables and fish. Years ago this was the snack that fisherman took with them on their boats, but this is a modernised version.